Hostess looks to expand its footprint beyond the packaged snack cakes aisle to the in-store bakery with the launch of the new Hostess Bake Shop line. - Decorated Twinkies - Golden sponge cakes with a creme filling with a chocolaty coating decorated with rainbow sprinkles and a white fudge drizzle. - Triple Fudge Ding Dongs - Chocolate cake with a creme filling covered in a dark chocolaty coating and white fudge icing. - Cupcake Cookies - Chocolate iced cookies with a vanilla squiggle. Compared to the brand's individually-wrapped and sealed snack cakes look for these to present a fresher experience (which also means a shorter shelf-life--about the same as a loaf of bread). They come in clear plastic clamshell containers much like a lot of baked goods you'd find at the in-store bakery. 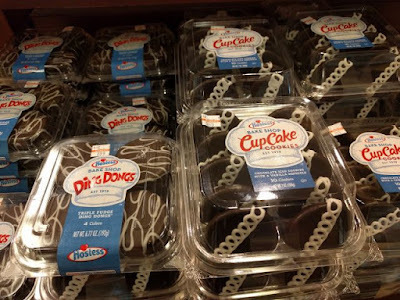 Hostess Bake Shop items are currently being rolled out and should be available nationwide in grocery, club, and convenience stores in the next few weeks. Pricing may vary but my local Albertson's supermarket has them for $3.99 per box.